Welcome to the Early American Coverlets & Counterpanes Study Group website. This study group is part of the study group system of the Complex Weavers. This website is a resource for the members of the study group. To join the group you must first be a member of the Complex Weavers. Attached is﻿ membership information ﻿about the group and the membership application. Per the description of the group on the Complex Weaver page. The Early American Coverlets & Counterpanes Study Group is looking for weavers who are interested in participating in research of 18th and 19th century American handwoven coverlets and counterpanes. The group researches both geometric and fancy coverlets. While the focus of the group is the research of these early art forms, the study group members will also share information on projects they have woven which are based on early coverlets and counterpanes. The newsletter will be published two or three times a year. The chair will write one article per issue on such topics as the elements of a coverlet, fabric analysis of coverlet patterns, a bibliography of coverlet related books, block design for coverlet patterns, weave structures used for coverlets and counterpane fringes. It will also include information about southern counterpanes. 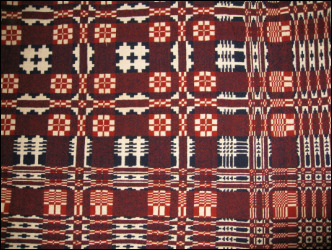 Members of the study group are asked to contribute book reviews, information on coverlet exhibits, articles on individuals contributing to coverlet research and weaving, as well as results of member’s research and weaving projects. The study group will include two annual exchanges: (1) a fabric analysis of an early coverlet or counterpane (August) and (2) a woven sample of an early coverlet or counterpane with instruction for a project using the pattern and weave structure (October). Additional information will be supplied on request. Informaton for the exchanges and the newsletters is shared on the group's website at www.coverletgroup.com/.. Also available on this website are the drafts and sample woven by the group related to their analysis of the coverlets shown in Kathleen Curtis Wilson's book entitled Textile Art from Southern Appalachia: the quiet work of women. In 2018, the group is starting a new project for the sample exchange, which includes weaving samples for a collection of 19th century southern overshot and counterpane drafts.